I am sick at heart over the loss of one of my favorite imaginations. The great Robin Williams struggled, seeking healing and help, for many years, in rehab and — according to a close friend of mine — in church. Costumed as Mork from Ork, he was on the cover of the first magazine I read as a child: an issue of Hot Dog! Soon after that, I eagerly opened an issue of Dynamite, which featured an interview. I can’t remember which of those two magazines it was − I was only 8 or 9 at the time − but one of them included an interview in which Williams talked about freedom of the imagination in a way that made a huge impression on me. He spoke of how his parents would buy him die cast model kits, and he would go home, open them up, mix up all of their pieces, and then build contraptions born of his own wild imagination. That method translated well to his frenetic, surprising, wildly unpredictable comic style. Nobody could improvise like Williams. But it was probably more than just imagination. His energy and uninhibited flamboyance were probably enhanced — in a way similar to steroids — by substance abuse. Moreover, his ability to fling himself beyond the bounds of our own imaginations was very likely driven by pain, by a compulsion to escape (or at least deny) a roiling sadness, fear, and suffering that was still waiting for him when he landed. For better or worse, he made magnificent art out of wrestling darkness. I could write a book on what his characters have meant to me. He made good movies great, and mediocre movies worth watching. I didn’t care for Spielberg’s Hook, but I loved Williams’s in it. Williams’s remarkable restraint was the most interesting thing in Awakenings. And while I cringed at how Mr. Keating in Dead Poet’s Society spurred his young students toward recklessness instead of maturity, Williams did a wonderful job of inspiring a love for the communal celebration of art, and that inspired me to begin a reading group that continues in my community almost 25 years later. But it’s The Fisher King that means the most to me. His performance as Parry moved me so deeply that I wrote about him in my moviegoing memoir, Through a Screen Darkly. And I was delighted to write a brief celebration of the film for Arts and Faith’s “Top 25 Divine Comedies.” In Terry Gilliam’s inspired masterpiece, Williams found the heart of a man who could be a fool, a clown, a dreamer, a lover, a grieving widower, a poet, an inventor, a dancer, and a Knight of the Round Table. He careened between seemingly impossible hopes and seemingly irreparable damage. With every Tasmanian-Devil flourish, he led us to suspect that this was not just a storyteller’s invention, but an actor revealing things about his own stumbling progress through life. And the stumble from which Williams cannot recover on his own… that stumble has me wondering. I know some lively, hilarious, flamboyant people. How much of their wild charisma comes from a deep need to be loved, or a compulsion to escape their darkness? Who among my friends and acquaintances might be feeling what Williams felt — a similar sense of weakness, oppression, or hopelessness? Who within my reach might be thirsty for a word of tenderness and care, for help in a time of fragility and perceived failure? I could let those questions hang in the air: Typical generalizations that turn this post into a chance for me to sound conscientious and big-hearted. But that wouldn’t be the truth. Last night, as I drove home from work, I listened to the NPR tribute to Robin William’s legacy, and there were tears on my face. They were genuine tears. I love what Williams gave the world. When I arrived at home, I sat on the couch and shared the news with Anne, who was shocked and saddened like most of us. And in those moments of sorrow, there was a knock at our front door. I opened the door to find an anxious, red-faced man with matted blonde hair and a sticky mustache. He was holding buckets, a spray bottle, and a long-handled squeegee. If William Sanderson — the actor who played Larry on the TV show Newhart and android designer J. F. Sebastian in Blade Runner — had played one of the homeless men alongside Robin Williams in The Fisher King, he would have looked just like this. And he was gone. He was gone very quickly. I felt even more ashamed. Anne was a few steps ahead of me, thinking of ways to help the stranger. I am not making any of this up. 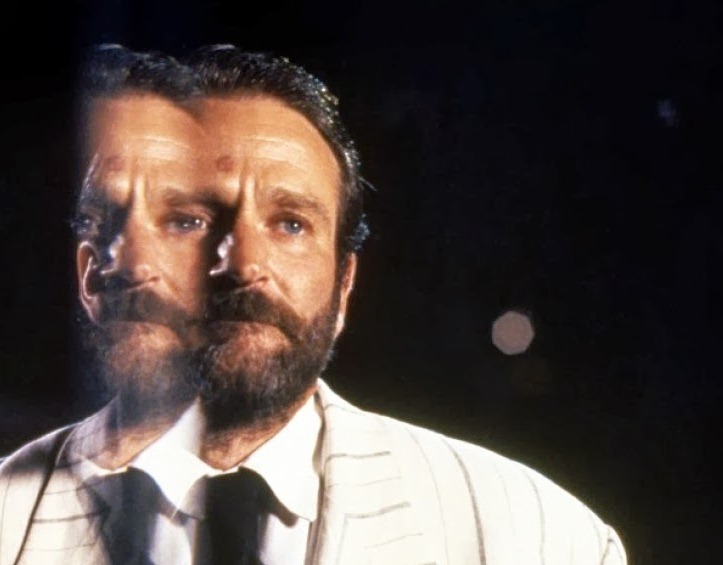 And what’s more — at the time, I was completely blind to the stark contrast between my distress over Robin Williams’s loneliness and despair and my attitude toward the man who had knocked on my door. Now, it seems like the farthest thing from coincidental timing. We went out the front door to call after him, but he was gone. We got in the car and drove around the neighborhood. And by God’s grace, we found him. He was walking along, door to door, with the stride of a character that Robin Williams might have played: a broken man, someone who has lost what once held him together, a Don Quixote charging at windmills with a sponge on a stick, a weary soldier staggering along in a desperate search for a Holy Grail. I approached him and apologized for being curt with him. He quickly waved his hands and told me that I’d done nothing wrong. He was far more gracious than me. Feeling awkward and unhelpful, I handed him a carton full of the pizza we would have eaten for dinner, which he immediately accepted. I gave him some money for bus fare. And he did not make any requests. He was grateful, and he moved on, looking for a way to share what he had to give in hopes of receiving something… just a little grace… in return. This did nothing to make me feel better. I still feel like a fool. It wasn’t enough. Too little, too late. Even after that sharp jolt of shame and my fumbling recovery effort, I feel that I showed only the barest trace of care for that stranger. I didn’t ask if he would like to join us for church on Sunday morning, where he might have met others who could introduce him to far more useful resources. I didn’t even ask his name. In that exchange, I was the one with the most missing pieces. So who am I to ask why Robin Williams succumbed, in one minute of one hour of one difficult day, to hopelessness? If a man with a loving wife, with children he cherished, with adoring fans all over the world — with all of these advantages that many of us covet, thinking they would solve our problems — can still stumble into the abyss during an hour of hopelessness, then I am probably surrounded by people who are teetering on that precipice every day. For I can see so many struggling with depression, addiction, regrets, and private shame… and most of them lack those advantages. Like the man on my doorstep, they don’t have family or a home. They can’t do a commercial and make a quick thousand bucks. They cannot fix what the world has broken within them. And they have no inclination to call out for a loving God because they do not see evidence of any such thing in the people he created… especially me. No, it wouldn’t be appropriate to beat myself up about how I failed the man who knocked on my door. That would be, in a way, egocentric and unmerciful. We all fail one another on a daily basis. We can all do better. I know I’m not capable of being anybody’s savior, but I can unfold the map of my experience and point to places of grace, places to which others have led me. I want to invite anyone who is thirsty to come back with me to places where I have found living water. The wells. The rivers. The oceans. In nature. In art. In community. In Christ. I want to be more vigilant. I want my friends to know that they can talk to me if they need a listening ear. I don’t want to be too busy for them. I don’t want to hear myself speaking shallow assurances. I don’t want to assume that somebody else is taking care of things. And I don’t want to pretend that I have all the answers. (If I had all the answers, I wouldn’t need any faith. I want to love. To suffer alongside. To echo others’ demands for understanding. To cooperate in an upward climb towards hope. And yet I know from experience that sometimes even a lavish show of love and grace is not enough for us to save each other from our weaknesses, diseases, and darkness. Sometimes the head, the heart, and the delicate internal compasses are too broken and we cannot find our way to the truth. 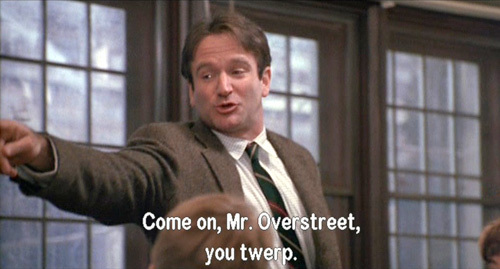 That yawning abyss around which Robin Williams desperately danced… there, but for the grace of God, go you. Go I. Even so: The darkness is weaker than the light. Even if it swallows us up. Because the light, too, was swallowed up. Remember? When you’re down, the light is down there with you. You cannot fall from its reach. mercy’s just a warning shot across the bow. And you can’t fail me now. Something in my heart resonates with these lines. I believe them to be true. I believe that God’s grace is great enough to overpower our own failures, and that love surpasses our capacity to imagine it. There is nowhere we can go that Christ has not gone before us, nowhere so far that our cries for him will not be heard by his mercy. In closing, I’d ask that you watch this clip from my favorite Terry Gilliam film… and my favorite Williams performance. Two of my friends posted it online within minutes of the breaking news, and I’m grateful, for it remains one of my favorite scenes from a lifetime of moviegoing. It resonates because the character, Parry, a poor and troubled soul who is searching for the Holy Grail, finds consolation in a story that is greater than himself, a story that may have given consolation to Williams during dark nights. I cannot imagine that those words, once memorized, ever stopped echoing in Williams’s mind, even if they were, in the midst of a crisis, momentarily drowned out by the voice of despair. May God forgive all of us for our moments of failure, and grant all of us the mercy and peace that our hearts so desire. Wow, Jeffrey, thank you for writing this. Earlier today I read a blog entry about Mr. Williams by someone else who claims to follow Christ and I was repulsed. Thank you for your insight, transparency and grace. Thanks Jeffrey- I was thinking about you yesterday. Your thoughts and insights are always appreciated. So very moving! Thanks for this and the reminder of just how broken we ALL are. He will be SO missed. Really appreciate your honest reflections, as always Jeffrey. I loved William’s amazing manic wildness, but like you, i also loved his incredible talent for the art of simple storytelling. I’d forgotten how much I liked the Fisher King when I first saw it in the 90s. For me, I’m always drawn to that double-pronged humour and honesty he interweaves through all his work. Mrs Doubtfire is another one that now strikes a chord with my own kids. It has us all in stitches laughing, yet drives such a steak in my heart when I resonate with that deep struggle that I think all marriages present. Such sadness of watching (and relating to!) such a careless, child-like character, when it’s married to a careful, realistic one. So funny, so real, so touching… just like all his work. Thanks for unearthing more about this divinely gifted man. I have been similarly struck, wounded really, by my own ability to love, to reach out. I will remember that lone figure on the sidewalk whom I failed to reach out to for the rest of my life. Thank you for your words, my friend. I’m just going to dive head first into this, Jeffrey. We both might regret it later, but luckily you won’t see me any time soon, so I’ll be able to hide if it goes badly. And I am crying as I write this and hoping the grandchildren won’t come in my room til I am once again covered with the mask I wear. And I am weeping all the more because I know that if you and I were face to face right now, you would hug me and love me and introduce me to your beautiful wife if she were there and maybe even give me some pizza. It is really hard to feel that kind of love sometimes. Because if I let the guard down to let love in, I usually can’t get it up again fast enough to avoid some other hurt. Life is hard. Adding the horrors of depression to that already hard life is more than a person can handle sometimes. While I hurt for the pain Robin Williams was experiencing, I am also angry that another of my fellow travelers on this horrid journey called “enough” while I am still trying to stay here. I’ve recently been abandoned by even more of my family and I am in pain, but I haven’t called “enough”. Dammit. So here I am raising my hand and waving, Jeffrey. I’m thirsty. Quite thirsty. Your honesty was healing for me. Thank you. I am thankful your heart was soft enough to let one man’s publicized tragedy open you to another who was present in your day.